Without proper wall insulation, your home is likely to cost you a lot more in energy bills. Proper insulation protects the inside of a building from the elements – keeping the interior cool in the hot summer months, and keeping the heat inside when the weather gets colder. Not only does good wall insulation and attic insulation keep your energy costs down, it also protects your property from damp, rot and mold, as well as pest infestations. This doesn’t just make things more comfortable for you or your family, but can also help to increase the value of your property in the long run. Valley Insulation specializes in installing cellulose insulation and fiberglass insulation for residential and commercial clients. You want your home to be comfortable, and wall insulation is a big part of making it just that. Typically, at least half of your energy costs for your home comes from heating costs in the winter and keeping the air conditioner running in the summer. Proper insulation is an effective way to reduce the need for both. This saves you money and keeps you and your family comfortable. The proper insulation even has the potential to increase the value of your property if you decide to improve its existing insulation. With the right soundproof insulation, you can also cut down on outdoor noises or even the noise from room-to-room. Valley Insulation has worked with countless families to turn their ideal home into their dream home. Our drill and blow insulation method is very effective for insulating your existing walls as long as it is a 3-1/2″ cavity and there is not any existing insulation in the cavity. We start by finding a stud. Then we measure to the next stud. We drill a 2-1/2″ hole in the middle of the cavity. We can do this either on the outside or inside depending on what material is on the outside of your house. Next, we pack the cavity full using tube methods. 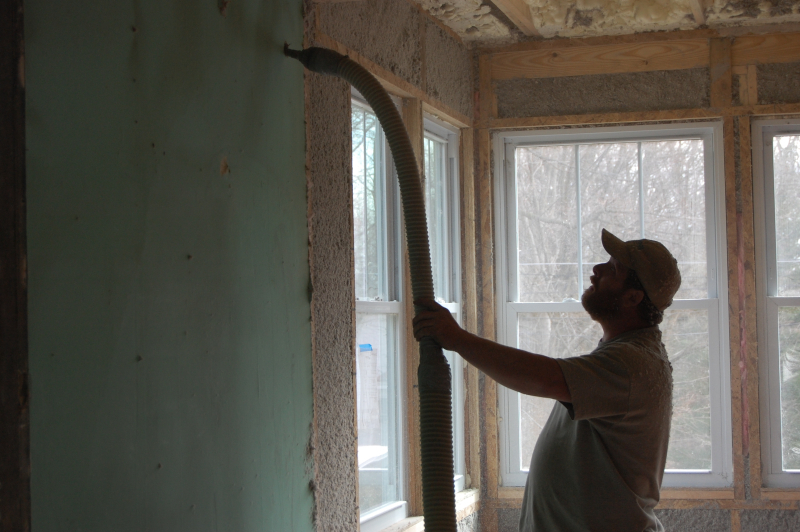 We use cellulose insulation to pack the cavity tight. One of our last steps is plugging the wall with a styrofoam plug. Valley Insulation does not finish repairing the holes. If you are interested in making your older home warm and quiet, please call us. If you’re looking for a company that will work with you to find the best solution for your needs, contact Valley Insulation, LLC today. With over 40 years of experience serving clients throughout Ohio, Indiana, and Kentucky, we have developed a true understanding of the importance of wall insulation, attic insulation and crawl space insulation for homeowners. Get in touch today to discuss your options, and how you can benefit from our dedication to quality and customer service.